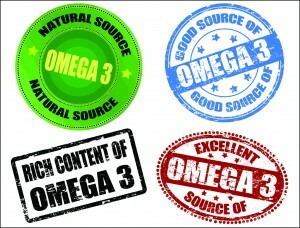 Omega-3 fatty acids are called essential fats because they are necessary for survival and proper health and functioning. Because the human body is unable to produce them on its own or synthesize them from any other sustenance, a direct food source is required. The science is clear that the body needs a balance of Omega-3 to Omega-6 fatty acids. However, due to the large consumption of processed foods, the American diet is heavy on Omega-6’s and low in Omega-3’s, creating an imbalance that can lead to ongoing, chronic inflammation. The danger of chronic, low-level inflammation is that it can persist undetected for many years. Its silent nature belies its destructive power, as chronic inflammation is seen as an underlying cause of many chronic, degenerative diseases and contributes greatly to the deterioration and decline associated with the aging process. Eicosapentaenoic acid (EPA) and Docosahexainoic acid (DHA), which are sourced mainly from cold water fish, shellfish and krill. alpha-Linolenic acid (ALA), which is sourced from vegetable oils, nuts, flaxseed, leafy vegetables and fats from grass fed animals. Linoleic acid (LA), which is abundant in corn oil, soybean oil and sunflower oil. Arachidonic acid (AA), which is found in liver, egg yolks, animal meats and seafood. Gamma-linolenic acid (GLA), which is found mostly in plant based oils such as borage oil and black currant seed oil. The ratio of omega-3 to omega-6 should be approximately 1:1. However the typical American diet is more likely to contain up to 25 times more omega-6’s. To balance out these fats for optimal cellular functions, we need to increase our intake of omega-3’s through diet or supplementation, and reduce our intake of omega-6’s. The Mediterranean diet, for example, has a healthier balance of essential fatty acids (EFA’s). This diet emphasizes foods rich in omega-3’s, including whole grains, seafood, fresh vegetables and fruits, olive oil, and spices as well as moderate wine consumption. Lowered risk factors for cardiovascular disease – Researched backed benefits include supporting a healthy heart rhythm, healthy blood vessel function, and reduced risk of cardiovascular disease through lowered levels of cholesterol, triglycerides and blood pressure. Improved brain function – Our brains are comprised of over 60% fats. EFA’s are important components of the entire nervous system, where they provide building blocks for healthy cells and tissues. EFA’s support healthy brain function, promote positive mood and wellbeing, support focus, memory and attention, and may help prevent progression of age-related memory loss. Increased energy, stamina and performance – EFA’s help build muscle, prevent muscle breakdown and speed recovery from fatigue. As high-intensity exercise increases demand on the circulatory system, EFA’s promote blood flow and oxygen delivery to the muscles, promote joint flexibility and support increased performance. Strengthened immune system – EFA’s naturally regulate and support healthy immune and inflammatory response, support internal repair systems in response to injury, have anti-inflammatory abilities and may slow damage from auto-immune diseases. Improved hair, skin and nails – Signs of EFA deficiency include dry, flaky skin, dull hair and brittle nails. EFA’s reside in membranes that surround skin cells, where they regulate a number of cellular processes that directly impact skin health. EFA’s support a healthy complexion, stimulate production of healthy skin cells, hydrate and nourish the skin and protect against free radical and age-related damage. Increased digestive health – Poorly digested foods wreak havoc on the immune system and can promote gut inflammation and increase the body’s toxic load. EFA’s help to improve gut integrity and decrease inflammation. Bone strength – EFA’s aid in the transport of minerals that keep bones and teeth strong, helping to prevent osteoporosis. The anti-inflammatory properties are especially beneficial to menopausal women in preserving bone health. From our hearts to our minds and every cell in between, omega-3’s are the healthiest fats you can consume for optimal function. They provide protection for our cardiovascular, musculoskeletal, gastrointestinal and immune systems. They insulate our nerve cells and support our central nervous system. A diet balanced in EFA’s is one of the best ways to create health, increase our life span and reduce our risks of degenerative and autoimmune diseases. Omega-Genics EPA-DHA 720 by Metagenics – OmegaGenics EPA-DHA 720 features a highly concentrated source of health-promoting omega-3 essential fatty acids from cold-water fish. Each softgel provides a total of 720 mg of EPA and DHA. Super EFA Complex (K-8) by Apex Energetics – Super EFA Complex formula, rich in omega-6 and omega-3 essential fatty acids, decreases both serum cholesterol and platelet aggregation. Complete Omega 3 Essentials 2:1 by Nutri-West – This product contains pharmaceutical grade molecularly-distilled EPA and DHA from cold water fish, ALA from flax seed oil, and GLA from borage oil. This entry was posted in Health & Wellness, Home and tagged Complete Omega 3 Essentials 2:1, omega 3, Omega-Genics EPA-DHA 720, Super EFA Complex (K-8). Bookmark the permalink.